Chinese Collection - New Titles Recently Added! Spanish Collection - New Titles Recently Added! By an acclaimed writer at the height of his powers, The Sense of an Ending extends a streak of extraordinary books that began with the best-selling Arthur & George and continued with Nothing to Be Frightened Of and, most recently, Pulse. This intense new novel follows a middle-aged man as he contends with a past he has never much thought about—until his closest childhood friends return with a vengeance, one of them from the grave, another maddeningly present. Tony Webster thought he'd left all this behind as he built a life for himself, and by now his marriage and family and career have fallen into an amicable divorce and retirement. But he is then presented with a mysterious legacy that obliges him to reconsider a variety of things he thought he'd understood all along, and to revise his estimation of his own nature and place in the world. 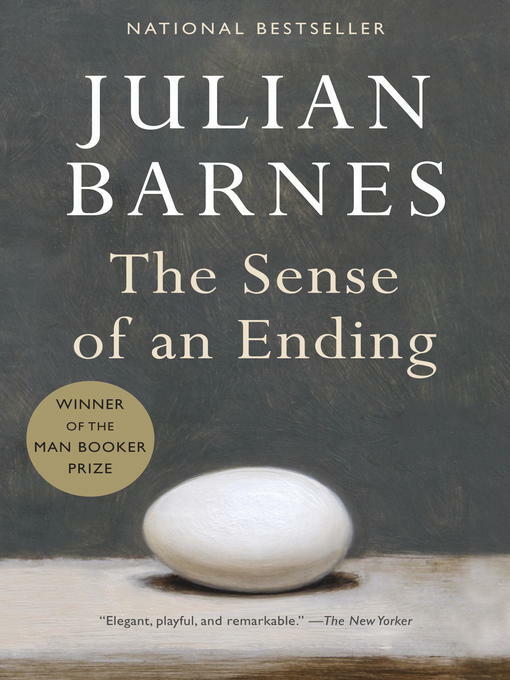 A novel so compelling that it begs to be read in a single sitting, with stunning psychological and emotional depth and sophistication, The Sense of an Ending is a brilliant new chapter in Julian Barnes's oeuvre.